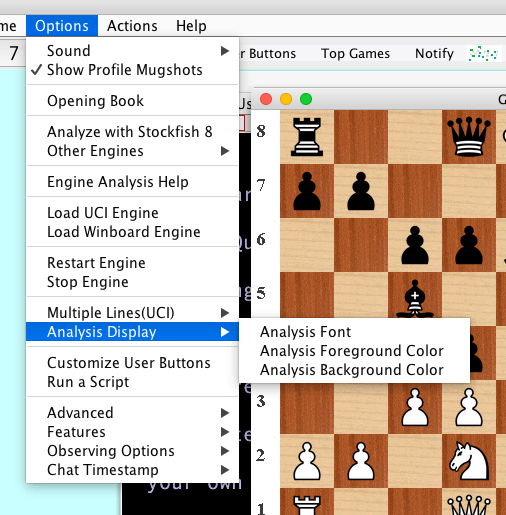 Lantern Chess a Java interface for Mac, Linux and Windows supports engine analysis while the user is examining or observing a chess game on Chessclub.com, accessible from a section of the Options menu. If the user has multiple game tabs, the chess engine will analyze the game in the currently active tab (as of version 5.55, the board window need not be active if just one board is open). When a game that the engine is analyzing ends, Lantern stops the engine; the user can also use the Stop Engine menu item at any time. Lantern supports two kinds of engines, with the Load UCI Engine and Load Winboard Engine menu options. An example of a Winboard engine is Crafty. Chess engines using the UCI protocol include Rybka, Stockfish(free for use with Lantern - stockfishchess.org/download/ - look for a file in the download like stockfish-8-64), Komodo and Houdini. As of version 5.98 Lantern now comes bundled with Stockfish 8 for Windows and Mac users and when examining or observing can activate it by going to Options / Analyze with Stockfish 8. Analysis appears in the board console. As of version 6.05 analysis is scored from white's perspective, not the side to move. Clicking on the tab of the game being analyzed toggles the view between the standard board console output (i.e., kibitzes and whispers, etc.) and the engine output. The chess engine will follow along, refreshing its analysis, as moves are played and the position changes. If the engine has stopped, and the user wants to start it on a different game, the Restart Engine menu item will start analysis using the same engine the user had previously loaded. The Multiple Lines(UCI) sub menu, introduced in Lantern 5.66, allows the user to choose between having a UCI engine analyze one line at once, two lines or three. This is a saved setting. If the engine is running, it must be stopped and restarted for a change in lines to take effect. The engine must also support multiple lines. In the Analysis Display submenu, the user can customize properties like the text color and font (including its size) of analysis and the background color, to be different from the standard console settings, as can be seen in the above image. The white background and Arial font defaults began in version 5.98. Lantern has been tested to make sure any analysis stops when a played game starts, in compliance with the ICC server rules for non-(C)omputer accounts. Starting in version 5.98 Stockfish 8 comes bundled with Lantern for Windows and Mac users and it can be activated with Options / Analyze with Stockfish 8. On first selecting this from the Options menu the user is prompted to let Lantern extract the engine to the Lantern folder. Afterwards going to Analyze with Stockfish 8 automaticaly starts the engine. Stockfish is a GPL program. On other engines submenu there is an option to analyze with Cuckoo Chess, a Java engine which comes bundled with the jar that is downloaded. These Java Engines only work in examine mode were UCI engines loaded like Stockfish will work in observed mode as well. Cuckoo Chess is rated 2588 computer chess elo. This rating is similar to FIDE for slow games. The user can download their own engines or use both. Additionally on the Other Engines sub menu, there is Mediocre Chess V0.5 is there, rated 2319 on the Computer chess rating list. Both engines are under GPL licence and the user can extract the contents of the Lantern Jar if they wish to get the engines folder which has CuckooChess and Mediocre Chess. Their readme's I created with information on how to get their source are in the Engines folder. As of version 5.93, when customizing the engine analysis font, the Chess Alpha 2 font can be selected. 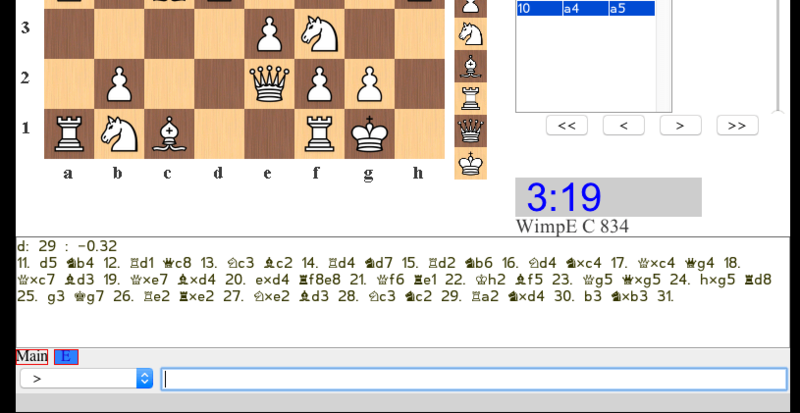 It's the same font used in move list and will display analysis with chess figurines as seen in below picture. When using this font things like warnings that the engine didn't load wont show properly as the font cant render them but if the user is comfortable they know how to load their engine, this should not matter. As of version 5.35, users can create a file named lantern_uci_script.txt in the Lantern folder and place valid UCI parameters to the engine in it. Multiple UCI parameters may be used in one script, with each one on a new line. These parameters will be sent to the chess engine when the engine is loaded. For example, setoption name MultiPV value 2 turns on multiple variation support, if the engine supports it, and then shows the top two current moves with a line for each. (Note as of Lantern 5.66 the number of lines of analysis is settable in the Multiple Lines(UCI) sub menu. If the user chooses One Line(Default) then a script parameter that is different can be used otherwise it is ignored.) Another useful parameter is setoption name Threads value 1, as some engines, like Houdini, use all available cores by default. Conversely, other engines, like Stockfish, use one core by default, so the user can also set it to use more cores.